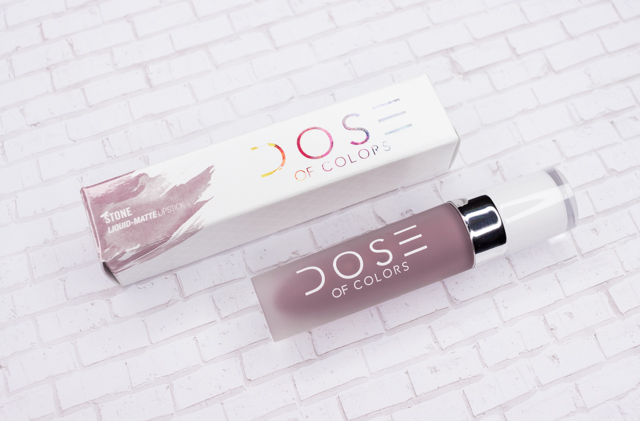 Dose of Colors' Stone Liquid-Matte Lipstick is probably one of the most highly coveted lip colors I have ever encountered. A few weeks ago, I finally was able to obtain my very own Stone liquid lipstick and I must say, I was very pleasantly surprised. On my lips, Stone translates as a neutral pinky-mauve with a hint of a brown undertone. I think this shade will compliment and flatter many, since it doesn't lean too cool nor too warm. I have tried my fair share of liquid lipsticks, and they have a tendency to feel heavy and drying. But, I am happy to report that Dose of Colors' Stone differs from the others since it contains a really nice formula. It goes on smooth, even, opaque, it feels comfortable on, and it quickly dries down to a gorgeous matte finish. Length of wear doesn't disappoint, either. Stone can stay put for hours-even through a couple of meals and drinks. It wasn't until 5-6 hours in that I started to see some fading taking place. Tip: try to avoid any foods that are on the greasy side, since the oils can break down the lip color and make it fade faster. I am loving the chunky frosted tube packaging of this liquid lipstick. But it's the angled sponge tip applicator that I love more as it always picks up and distributes the right amount of product, and helps me apply the lipstick precisely, since it effortlessly hugs the curve of my lips. Overall: For my first foray into Dose of Colors' Liquid-Matte Lipsticks, I am very impressed with Stone. The formula is top notch-one of the best I have come across when it comes to liquid lipsticks, the lovely and wearable hue couldn't be anymore up my alley, and I can now see why this is always getting so much hype. Before I forget to mention, Dose of Colors' liquid lipsticks are vegan, cruelty free, gluten free, and paraben free. I am looking forward to trying more lip products from Dose of Colors. I think their lipsticks and lip glosses are up next. 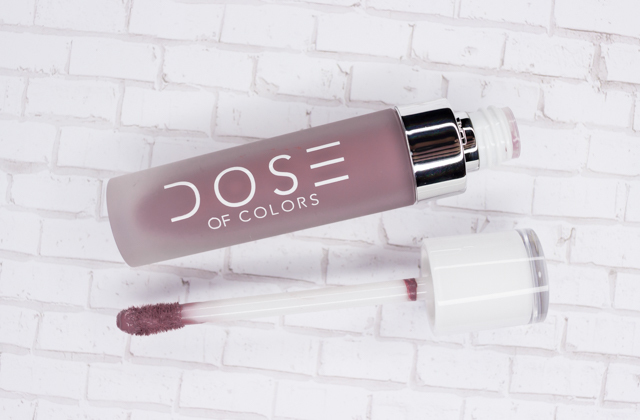 What do you all think of Dose of Colors' Stone Liquid-Matte Lipstick? I think you would love Stone, Coco. I recently picked up two more colors that I can't wait to share on here.